I’ve been traveling to Las Vegas to play in poker tournaments at least once or twice a year for the past decade, so I’ve dined at many recommended steakhouses. Tom Colicchio’s Craftsteak is easily my favorite steakhouse in Las Vegas, and is one of only two restaurants that I try to visit each time I’m in town. 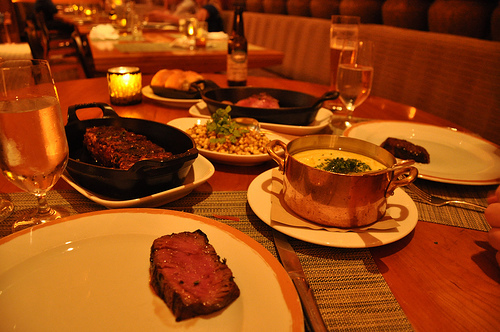 What pushes Craftsteak to the top for me is the combination of the steaks, side dishes and service. You are unlikely to get a bad steak in any of the top Las Vegas steakhouses, but not all of them serve high quality American wagyu steaks. Craftsteak has an ever changing selection of wagyu cuts. They typically have New York strip, ribeye, skirt steak, filet mignon, and flat iron. 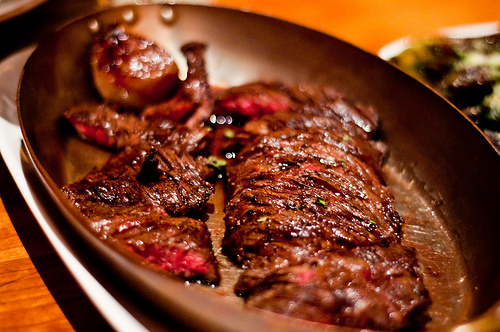 My favorite wagyu cuts at Craftsteak are the skirt steak and the flat iron. Although they were often fantastic when cooked medium rare, I’ve been more consistently happy with the steaks once I shifted to asking for them to be cooked medium. I find that Craftsteak’s wagyu cuts have just enough extra marbling that they need a bit more cooking to render the fat. The side dishes at Craftsteak are sized for sharing, so make sure you don’t order too much of any one side. I’ve never encountered a side dish that didn’t live up to our high expectations, so I would recommend you try several sides. My general philosophy on food tends towards the “Vegetables are what food eats” end of the spectrum, so I usually stick to my Craftsteak staples: potato purée, baby carrots, and corn. My fellow diners typically add on orders of hen-of-the-woods mushrooms, brussels sprouts, and asparagus. The service at Craftsteak is well matched to the food. They have teams of two servers in each section, which allows for very attentive service with someone often within sight in case you need something. I’ve always had great service at Craftsteak, and we have one waiter in particular who we ask to get if he is working that day. 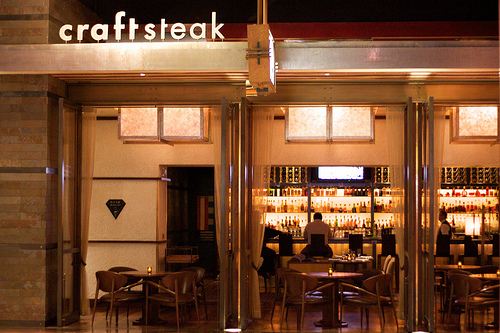 If you are going to be in Las Vegas and want to try a great steakhouse, I wholeheartedly recommend Craftsteak. I suggested it to a well traveled colleague who had some clients to entertain, and he sought me out the next day to shake my hand and thank me for my recommendation.